On the 70th anniversary of the D-Day landings, Brian Williams led off NBC Nightly News this way: "On our broadcast tonight, the salute to the warriors who stormed the beaches here in Normandy..." It's such a commonplace of our American world, that word "warriors" for those in the U.S. military or, as is said time and again, our "wounded warriors" for those hurt in one of our many wars. This time, however, because it was applied to the vets of World War II, my father's war, it stopped me in my tracks. For just a moment, I couldn't help imagining what my father would have said, had anyone called him -- or any of the air commandos in Burma for whom he was "operations officer" -- a warrior. Though he's been dead now for three decades, I don't have a moment's doubt that he would have thought it ridiculous. In World War I, America's soldiers had been known as "doughboys." In World War II, they were regularly (and proudly) called "dogfaces" or G.I. 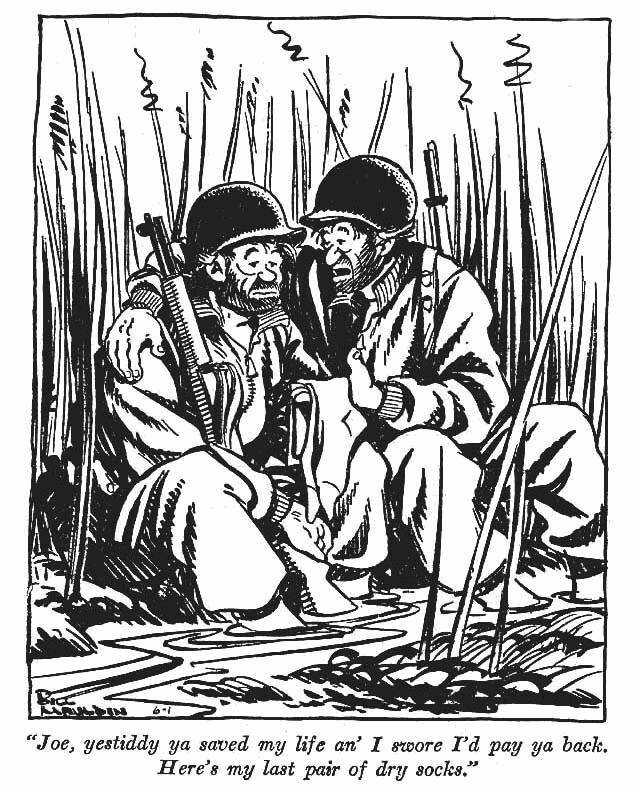 (for "government issue") Joes, and their citizen-soldier likenesses were reflected in the tough but bedraggled figures of Willy and Joe, Bill Mauldin's much beloved wartime cartoon foot soldiers on the long slog to Berlin. My father volunteered just after the attack on Pearl Harbor and wasn't demobilized until the war ended, but -- I remember it well in the years after -- while he took pride in his service, he maintained a typical and healthy American dislike (to put it politely) for what he called "the regular army" and George Washington would have called a "standing army." He would have been amazed by the present American way of war and the propaganda universe we now live in when it comes to praising and elevating the U.S. military above the rest of society. He would have found it inconceivable that a president's wife would go on a popular TV show -- I'm talking about Michelle Obama on "Nashville" -- and mix it up with fictional characters to laud for the umpteenth time America's warriors and their service to the nation. In Vietnam, of course, the term still wasn't warrior, it was "grunt." The elevation of the American soldier to the heavens of praise and bombast came significantly after the end of the citizen army, particularly with what retired Air Force Lieutenant Colonel and TomDispatch regular William Astore calls the new Fortress America mindset of the post-9/11 years and the ever more militarized world of constant war that went with it. I spent four college years in the Reserve Officers' Training Corps (ROTC) and then served 20 years in the U.S. Air Force. In the military, especially in basic training, you have no privacy. The government owns you. You're "government issue," just another G.I., a number on a dogtag that has your blood type and religion in case you need a transfusion or last rites. You get used to it. That sacrifice of individual privacy and personal autonomy is the price you pay for joining the military. Heck, I got a good career and a pension out of it, so don't cry for me, America. 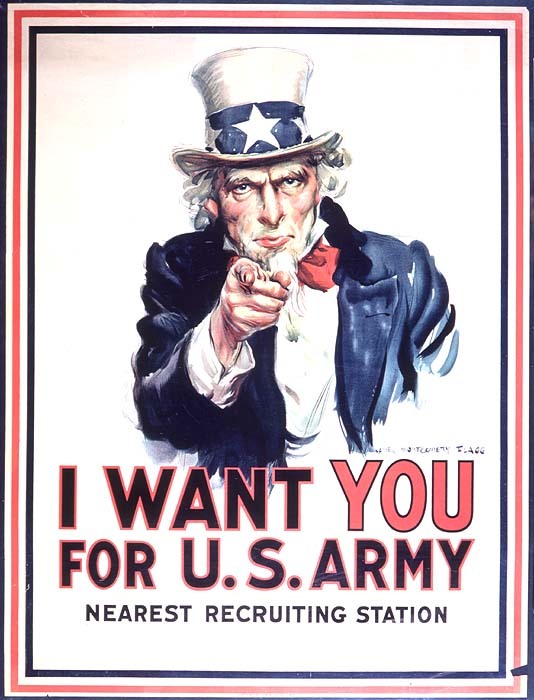 Unlike the recruiting poster of old, Uncle Sam doesn't want you anymore -- he already has you. You've been drafted into the American national security state. That much is evident from Edward Snowden's revelations. Your email? It can be read. Your phone calls? Metadata about them is being gathered. Your smartphone? It's a perfect tracking device if the government needs to find you. Your computer? Hackable and trackable. Your server? It's at their service, not yours. Many of the college students I've taught recently take such a loss of privacy for granted. They have no idea what's gone missing from their lives and so don't value what they've lost or, if they fret about it at all, console themselves with magical thinking -- incantations like "I've done nothing wrong, so I've got nothing to hide." They have little sense of how capricious governments can be about the definition of "wrong." Let's hear no whining about militarized uniforms on America's playing fields. After all, don't you know that America's real pastime these last years has been war and lots of it? Think of the irony. The Vietnam War generated an unruly citizen's army that reflected an unruly and increasingly rebellious citizenry. That proved more than the U.S. military and our ruling elites could take. So President Nixon ended the draft in 1973 and made America's citizen-soldier ideal, an ideal that had persisted for two centuries, a thing of the past. The "all-volunteer military," the professionals, were recruited or otherwise enticed to do the job for us. No muss, no fuss, and it's been that way ever since. Plenty of war, but no need to be a "warrior," unless you sign on the dotted line. It's the new American way. But it turned out that there was a fair amount of fine print in the agreement that freed Americans from those involuntary military obligations. 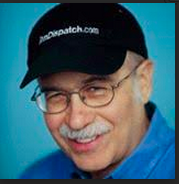 Part of the bargain was to "support the pros" (or rather "our troops") unstintingly and the rest involved being pacified, keeping your peace, being a happy warrior in the new national security state that, particularly in the wake of 9/11, grew to enormous proportions on the taxpayer dollar. Whether you like it or not, you've been drafted into that role, so join the line of recruits and take your proper place in the garrison state.